Published by Dan Gooding at 2:50pm 24th December 2018. This is the Mix96 Guide to everything important you need to know over the festive period in and around Buckinghamshire. From those bin collections, to pharmacy opening times and more, we have got you covered. You should call 999 in a medical emergency – when someone is seriously ill or injured and their life is at risk. 111 is the NHS non-emergency number. It’s is the free number to call when you have an urgent healthcare need. It directs you to the right local service, first time. This is a Buckinghamshire based website to help you find the most appropriate local health service for common symptoms. The GP-led minor injuries and illness unit (MIIU) is open 24 hours a day, seven days a week, based at High Wycombe hospital. The out of hours GP service in Bucks is accessed by calling NHS 111, they will asses your condition and then decide if you need referring to this service. 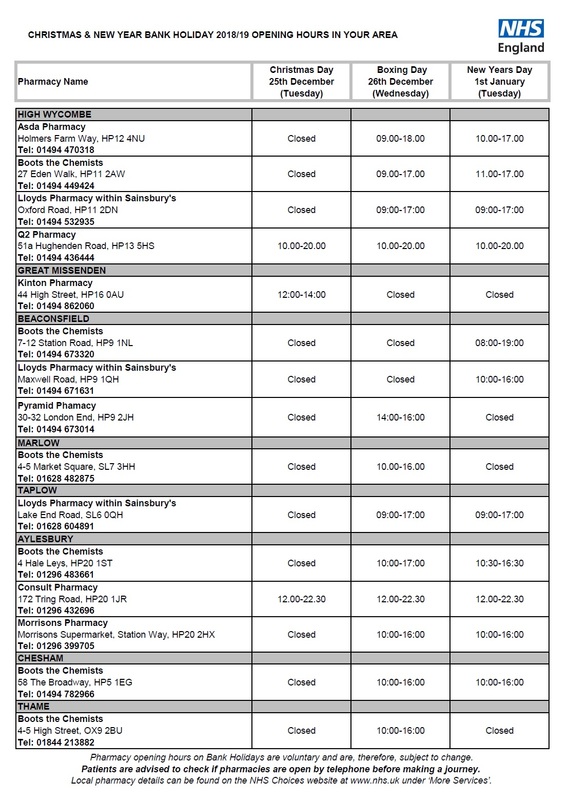 Pharmacy opening times Pharmacies will be closed at different times. Click above for the list. 23 December - An amended Sunday timetable will operate, with additional capacity provided on Marylebone/Oxford service. This is because of engineering work on the London Paddington to Oxford route. Select here to view the timetable. 24 December - An amended Monday-Friday timetable will operate, with an earlier-than-usual finish. Make sure you check your journey carefully. Select here to view the timetable. 25 December – No services will run on Christmas Day. 26 December – Chiltern will be running between Oxford Parkway and London Marylebone. A special service of two trains per hour in each direction will operate over the following route, between approximately 0800 and 2000: Marylebone - Gerrards Cross - Beaconsfield - High Wycombe - Princes Risborough - Haddenham & Thame Parkway - Bicester Village - Oxford Parkway. Please note that no trains will call at Wembley Stadium on this date. Select here to view the timetable. Thursday 27 December – An amended Saturday timetable will operate. Select here to view the timetable. Friday 28 December - An amended Saturday timetable will operate. Select here to view the timetable. Saturday 29 December - There is a sporting event at Wembley Stadium - Tottenham Hotspur vs Wolverhampton Wanderers (15.00 KO). An amended timetable will operate for most of the day. Select here to view the timetable. Sunday 30 December – An amended Sunday timetable will operate, with additional capacity provided on Marylebone/Oxford service. This is because of engineering work taking place on the London Paddington to Oxford route. Select here to view the timetable. Monday 31 December - An amended Saturday timetable will operate, with additional after-midnight services from London. Select here to view the timetable. 1 January – On New Year’s Day, an amended Sunday timetable will operate. Select here to view the timetable. 2 January – Back to December - May 2019 timetable. The latest from London Northwestern here. Most bus services will run their Saturday timetables. Those buses without a Saturday service will run their normal weekday timetables. Early finish on some services please see the operations chart for last buses. No service, except on Star Travel's 3, 5, 5A, Arriva's Sapphire 280, Metroline's 331 and National Express services. Please see the operations chart for details or contact the bus company. Most bus services will run their Saturday timetables on these days. Those buses without a Saturday service will operate their normal weekday timetables. However, operations will vary so please check your service on the operations chart. No service, except on Arriva's Sapphire 280, Metroline's 331 and National Express services. Please see the operations chart for details or contact the bus company. You can check what goes in which bin here. Check you bin day here. Check your bin day if you live in the Chiltern District here. Household waste sites - Bucks. Closed Christmas Day, Boxing Day & New Year's Day. Check other opening times here.